← Volume 2: McLaren M23, (1974 and 1976) photobook available! This week, I had opportunity to think about Derek Gardner once again and reflect on how much Derek’s memory is cherished by Margaret his widow and their family, Helen and Rachel, when I visited them. It’s been a little over five years since he passed away and the greatness of his whole career spent in innovative design, is best appreciated amongst motorsport fans, by considering his seven years spent in the employment of the Tyrrell Racing Organisation, as it was first known. Before this and since, he expressed his design genius in other areas, notably aviation, auto-transmissions and even boats. When visiting Margaret again in November 2013, we were able to recognise that without Derek, there would have been no Championship Tyrrells, an accolade in itself. 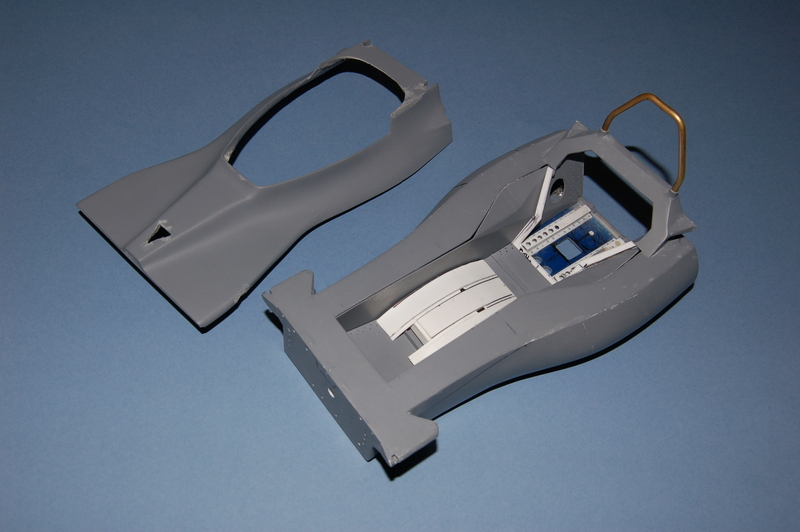 Tyrrell P34 the six-wheeler was a sensation at first launch and after an initial flush of success in 1976 (including a one-two finish at Anderstorp, Sweden), the inertia of winning ways departed. Goodyear failed to maintain the necessary research and development on the small ten inch front tyres, so the ‘car’ also failed and disillusioned drivers left, especially Jody Scheckter who had won the 1976 Swedish Grand Prix with the car and was a creditable third in the Drivers’ Championship that year. 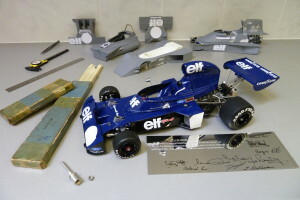 During Derek’s time at Tyrrell, they had won the Drivers’ Championship twice (Jackie Stewart) in 1971 and 1973 with 003 and 006 respectively, winning the Constructors’ title in 1971 also. This photograph celebrates some of Derek’s Tyrrell designs in 1/12 scale, the 006 Championship winning car in the foreground, 001 in the background towards the left and two 007’s (1974/5) in the background centrally and towards the right. For this photograph, Derek’s slide-rule as used in period and referred to on page 162 of Jackie Stewart’s autobiography Faster, has been placed appropriately alongside on the LHS; thank you Margaret.